As everyone in my life gets busier, relocates, and has more responsibilities/obligations than ever, one on one time with friends and family has become my most treasured gift. It means so much more to me than any trend or gift card ever will. So, without further adieu, allow me to share my top ten experiences for 2017! Tickets. My best friend and I tend to go to a concert around Christmas to hang out and do something we both love, but whatever your ‘thing’ is with someone, the gift of time with you doing what you love is greater than any physical item. Spa Treatment. My sister and I have been talking about giving each other facials for Christmas. We both love taking care of our skin and I haven’t gotten a facial since our trip to Florida last year. Going to have a little sister spa day is a dream come true, since we can hang out together and take care of our skin! Movie Pass. I am a huge movie person, and I have been spending the last two years trying to catch Bryan up on movies I’ve seen, liked, or just want to discuss. We’re thinking of getting Movie Pass, so we can see as many movies as we want. With so many movies I want to see coming out, plus the dreary winter months ahead, it will be a great way to get out of the house when there isn’t too much to do. Groupon Experience. Using Groupon (and Goldstar) is one of my favorite ways to organize group activities. Both sites have some really cool experiences, and the prices make it so easy to try different things! One: Coach Rexy Earrings. I was the biggest dinosaur kid on the block, and these fun little earrings play right into my wheelhouse of adult style as well (bonus: they’re currently 30% off!). Two: A Little Bit of Nirvana Collection. Elizabeth and James make my favorite four perfumes in the entire world, and they’re currently bundled together in this perfect little collection. Three: Martha Stewart & Mario Badescu Skincare 20s Kit. Martha is a personal icon of mine (when she’s not doing illegal things), and Mario Badescu is a skincare legend, so this match is of the ‘made in heaven’ variety. They have skincare kits for *every* age (shop them all here), so it makes a great gift for anyone of any age!! Four: Sunday Riley Brightening Kit. Sunday Riley is such a splurge brand I rarely ever buy their products, but I absolutely love them. Five: The Little Book of Cacti. I love plants (which would be another great gift idea) and this little book is both fun and useful! Six: Kate Spade Apple Watch Strap. I definitely want a leather apple watch, and this one is currently on sale for 30% off! Seven: Tory Burch Tote. I really want a good quality, small tote bag and this beautiful Tory Burch bag is a great deal right now! One: Ray-Bans. Whether it’s these classic wayfarers or a pair of aviators, classic and quality sunglasses will go a long way. I gave B a pair of Wayfarers last year and he scarcely doesn’t have them on him. Two: Beanie. I think everyone could use an update on cold weather accessories each December, and guys are no exception! Three: Skincare Products (and advice). What I’ve come to notice between my brother, boyfriend, and dad is that most men want better skin, they just aren’t really sure how to go about getting it, and they sure aren’t about to walk into Sephora on a Saturday to figure it out! Your advice and help in finding products that work for his skin type would go a very long way – B is now a dedicated Ole Henriksen user – and it’s not even a Man-Targeted skincare line! (See more on what he thinks of the products in this post). Four: Duffel Bag. Does anyone not love having a stylish weekender bag? No? Didn’t think so. Five: Backpack. If your guy is still bringing his beat up college backpack into the office every day, do both of you a favor and pick up this durable and stylish Herschel backpack. Y’all can thank me later. Six: Barbour Jacket. My male friends have become really comfortable around the fact that I have a fashion blog, and they love asking me for advice on how to dress and where to find the best items for different seasons. The question they ask me the most is what jacket to buy for late fall/early winter. I’m not even kidding this is a frequent flyer question that I should really start cashing in on. I think this Barbour jacket is perfect and timeless, and anyone who runs hot will be able to get a lot of use on it through the winter as well! Seven: Slim Fit Pants. For the thinner guy, pants that fit him can be a frustrating endeavor. Nearly all of the men in my life are skinny, and also unwilling to splurge on pants or jeans that fit them well. Picking out a pair for him would go a long way in avoiding spending his weekend in Nordstrom scratching his head. Eight: Chukka Boots For the guy who is hesitant to embrace more fashion forward trends, but doesn’t want to be wearing Doc Martens from 1995, the Chukka Boot is a nice compromise which looks sleek and not too flashy. Nine: Tool Kit. For the guy that wants to be helpful around the house but maybe doesn’t have all the tools he needs. (This would be great for a college kid or an early 20something). Ten: Sorel Boots. Sorel makes amazing boots for both men and women. Whether you live in a snowy suburb or a chilly city, everyone has a need for quality winter boots in the Northeast! One: Dopp Kit. The bigger the beard, the more grooming products that come with it. I’m also pretty sure time in a relationship effects this, because Bryan travels with almost as many products as I do now, but I digress. A cool Dopp Kit is essential for any man’s travels, and I love this sleek olive one from Herschel (a long time favorite brand of mine!) There’s also this cool one for $20 less! Two: Grooming Kit. This sleek black case is perfect to slide into the aforementioned Dopp Kit! Three: Beard Balm. B absolutely swears by Honest Amish products, and uses the “heavy duty” beard balm. Whether it’s giving him a new one to try or replacing his all-time favorite, beard balm is sure to be a winning gift. Four: Shaving Set. A proper badger brush and good razor will change the way a man shaves. I’ve worked with Danielle (founder of eShave) before and her products are the real deal. (Their website has a lot of shaving resources as well, should you feel the need to nudge someone in that helpful direction ;)). Five: Hand Repair Balm. Guys get cracked and dry skin too, and you don’t want to hold an alligator’s hand all winter. Enter this “Bloody Knuckles” masculine hand balm – the gift for both of you. Six: Cannon Balm. Reading the description on this stuff absolutely cracks me up, so definitely give it a quick read on the website for a good laugh. Then apply my thoughts on the hand balm to lips and voila – another perfect grooming gift. 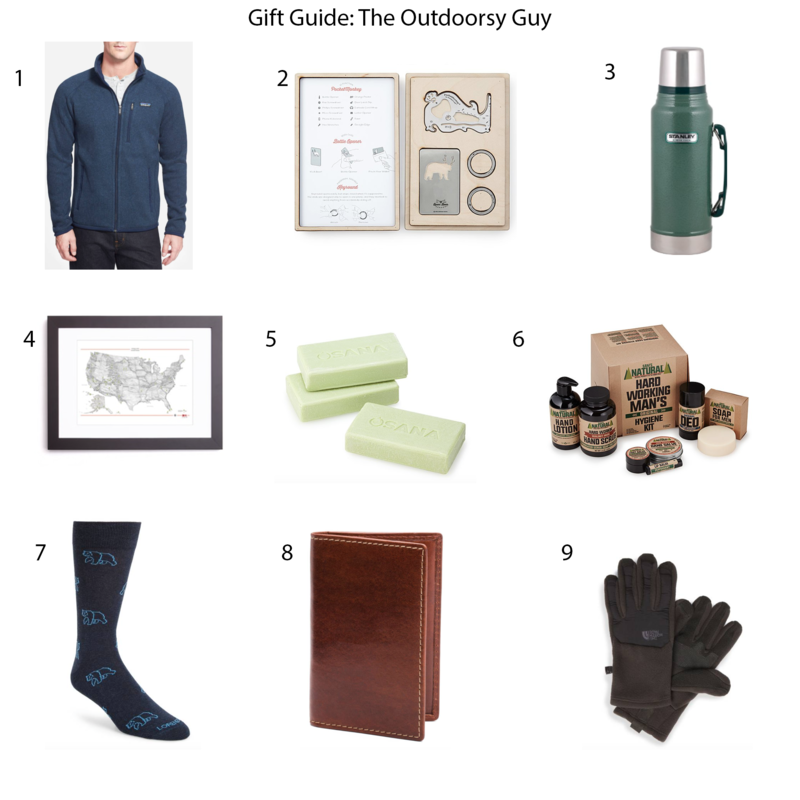 One: Patagonia Jacket Patagonia is a quality brand that makes a great gift for anyone. That being said, I think most outdoorsy guys will appreciate the quality of the product and what the brand stands for most in their day to day life, wearing this outside or inside! Two: Multi-Tool Box of Wonders. Not only do these have awesome animal shapes, but the slim design makes them super easy to travel with. Four: National Park Map. File under “when he’s stuck indoors”. Five: Mosquito Repellant Bath Soap. Apparently it does exist! Six: Hard Working Man’s Hygiene Kit. This is as much a gift for you as it if for him. You’re welcome. Eight: Leather Card Case. This little guy is sleek, slim, stylish, and easy to stash anywhere. Nine: The North Face E-Tip Gloves. The quality of North Face is bar none, and these allow him to navigate AllTrails with ease throughout the winter months.